What Is Bokashi Tea - How To Harvest, How And Where To Use It? 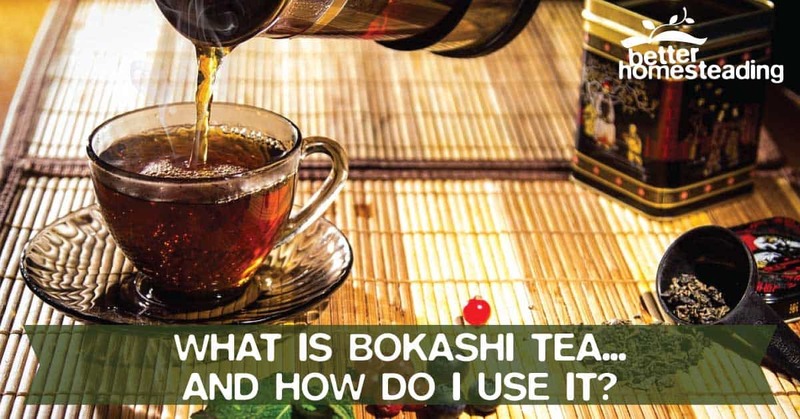 Homestead Garden > Composting > Bokashi > What Is Bokashi Tea And How Do I Use It? Bokashi tea is the liquid that is generated from the kitchen scraps you compost in your Bokashi bin. The greater the amount of food waster that is fermenting in the bin, the more of the liquid will be given off. Also known as Bokashi leachate (it leaches out of the scraps in your compost bin), this tea won't win any prizes for taste or a fine bouquet. It's not for human consumption I can assure you! If you consider the Bokashi composting method as fermentation as opposed to composting in the traditional sense, you'll learn that it is an anaerobic process, in which billions of microbes eat the sugars in the scraps. This process results in liquid being formed, which drains to the bottom of the Bokashi bucket as the process continues. The compost tea is extremely rich in nutrients and microbes. you can add it to your vegetable garden, your lawn and house plants to give them a much needed boost in nutrients. It's an extremely concentrated solution, so it's always best to dilute it in water before watering your plants. Harvesting is easy. If you own a Bokashi bucket which you have purchased, or were inspired to make your own Bokashi bucket, you should have a tap that you can open to harvest the juice. Expect to get 1 -2 cups a day of the liquid every couple of days, depending on how much waste material you are able to add to the bucket. Composting relies on microbes, bacteria, fungi worms and a whole host of other micro-fauna to break down the organic matter into that 'black gold' that gardeners love. By adding the Bokashi liquid to your garden compost pile, you help speed up the composting process by adding billions of microbes. Fresh liquid should be used as soon as you've harvested it from your Bokashi bin. Dilute and water into the pile. This seems like an odd one, but it really works. Bokashi bacteria will help unblock a drain and also add a healthy diversity to your local water treatment system too. The liquid Bokashi compost is extremely high in nutrients and microbes, it's an incredible source of nutrition for house plants, lawns, vegetables, fruit, you name it, Bokashi tea is awesome. As the fermentation process results in the formation of lactic acid, it's important not to just pour the liquid directly onto your plants. Dilution is the key here. A 100 parts water to 1 part compost liquid is a good starting point, but the dilution guide below will help you fine tune things. Here are some dilution rates for your Bokashi tea. I love Bokashi composting, and Bokashi tea is a great additional benefit you can use while your bucket is being filled. It might not smell the best, but your plants will flourish with this incredibly rich new food source.